Holiday Appetizers 101: Gorgonzola Stuffed Olives. Many of the appetizers I have posted have been pretty darn simple. And quick. This one takes the cake, though. Speaking of past appetizers, have you missed any? It doesn’t get much simpler than these olives and gorgonzola. And it is super classy, impressive, and deliciously mouth-watering. I buy a container of seasoned, pitted olives. After eating my weight in olives, I stuff a few with crumbled gorgonzola for the hungry guests. These are always crowd pleasers. The soft, creamy gorgonzola combined with the salty olive makes for the perfect combination. This appetizer is also a nice size – guests can thoroughly enjoy them without stuffing themselves before the main course. Make sure all pits are out of olives. Fill the olive opening with one large or a few small gorgonzola crumbles. Serve with crackers, cheese and fresh bread. Check out these juicy olives. my niece can say 4 words: mama, dada, ball (baaaa! ), and olive (ah-wiv). she can help me make these at christmas. because my fiance won’t eat them. how is a baby less picky than a grown man? How yummy! I usually make stuffed black olives with pepperoni! I think the buffalo chicken dip still takes the cake though… tough choices. I don’t like olives, but these look delicious – and I must make them for friends. Another great one is gorgonzola stuffed dates. Super delicious and easy! Oh yes, so yum. I want these right now. I have olives, but no gorgonzola. My mouth literally started to water while reading this. You wanna know what’s suuuuuuper yummy? Bleu cheese-stuffed olives in a dirty martini…oh my…Cheesecake Factory. Ultimate martini. Try it today. DEEEEEEEE-VINE. I’m in for the martinis! Let me know when you try one (notice how I’m not saying “if”). Haha, they’re beyond awesome! I bet they taste sublime. I’ll shake the martinis. You make these. Deal? Thi sis BY FAR my favorite post of yours. Can I telly ou how obsessed with olives I am? Literally, since I was a little girl, my relatives are sure to purchase a jar of olives before I come. IN fact, this Thanksgiving my uncle was sure to have both black and green olives out on the table when I arrived. What a treat. And, the cheese stuffed ones are even better, I’m salivating form those pics! If you love dirty martinis. I’d love to send you a sample of my company’s product. Your guests are certainly spoiled with some of the BEST appetizers! Delicious. so simple, so delicious!!! 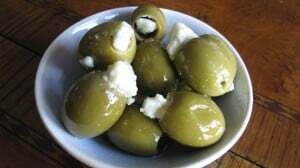 I love olives esp if they are stuffed with cheese!! yumm..i love olives and gorgonzola. will most def try this. if you put yogurt in a cheese cloth and let the way come out, it becomes like a creamy consistancy and it goes great with olives and mint! Isn’t it funny how the easiest things to make are often the most impressive thing on the table?! I LOVE olives but not so much the gorgonzola… but I KNOW my husband and friends/family would love these! So simple yet perfect! Love it! Thsoe look delicious! What a great appetizer that would make. so easy! I love olives because they always look pretty, you know? All these yummy appetizers make me wish I had enough space to entertain more often!